The Parks and Gardens department of NPARC Environmental Services maintains all parks and gardens, including the cemeteries. They also manage any significant improvements or remedial works to community green area. The department's objectives are to ensure NPA Communities' Parks and Gardens are clean, safe and accessible for public use, and that cemeteries are accessible and well presented. Parks and Gardens also conducts controlled burn-offs to reduce the risk of fire to houses and facilities during the Dry season. 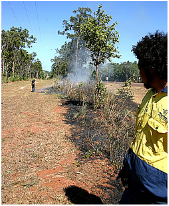 Burning off in rural areas has been carried out by indigenous Australians for centuries. After burn offs, the bush will grow back stronger and healthier.